Regular guacamole gets a different flavor with this Mediterranean alternative. 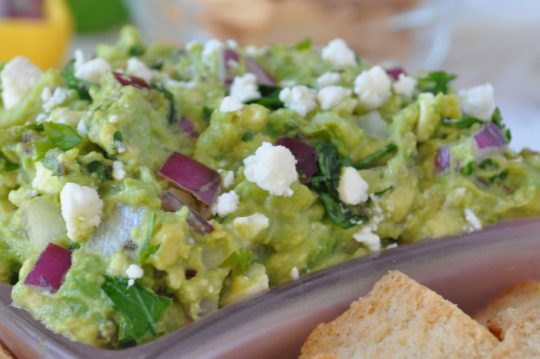 Feta cheese, rice vinegar and dried oregano leaves add a delicious taste to traditional guacamole. Shake things up by combining two different flavors into one mouth-watering dip. This dip definitely satisfied the cravings of this avocado and feta addict. In bowl, gently stir together avocado, onion and garlic. Mix in parsley and oregano. Gently stir in olive oil, vinegar and feta. Refrigerate or serve. Recipe makes 5 (1/4 cup) servings.